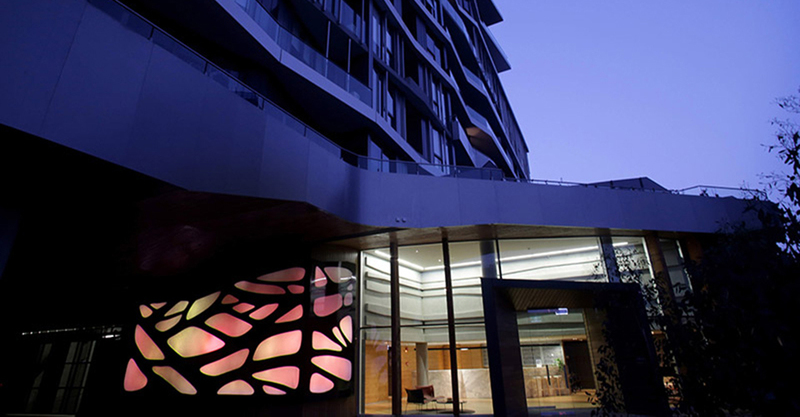 The Acacia Light Wall is a permanent public artwork within the 3 stage Eden on the Yarra – a residential / commercial development on Victoria Street Abbotsford, Melbourne. 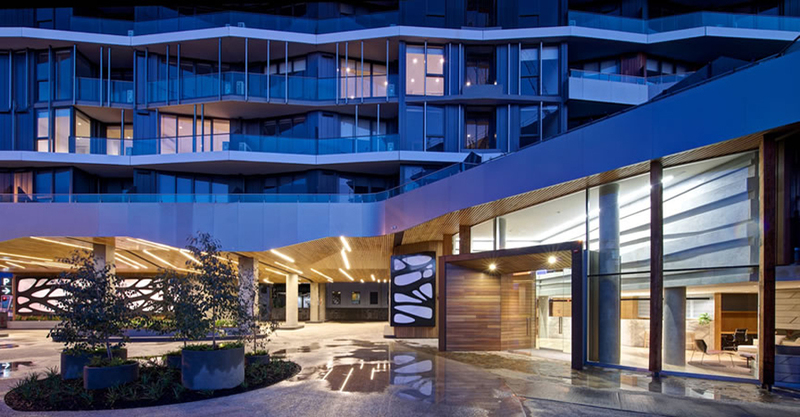 The work was commissioned by the Hampton Group for Acacia Place, the first building in the development. 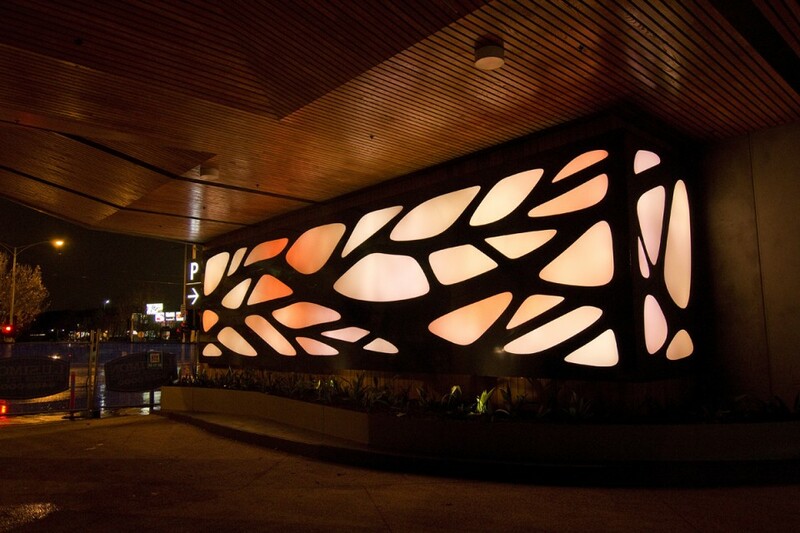 The stylised screen was inspired by tangled wattle trees (Australia’s most common Acacia). 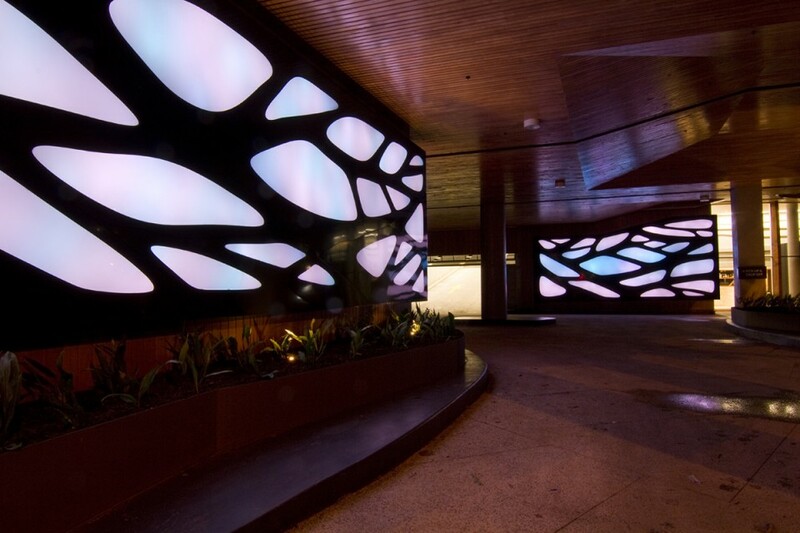 The work consists of two walls, made from laser cut aluminium screen, acrylic ‘windows” Philips Colour Kinetic controllable LED (1250 nodes), Philips Colour Kinetics control ‘iPlayers”. One wall is 10 m long x 3 to 5 metres and the second is 12m by 3m. 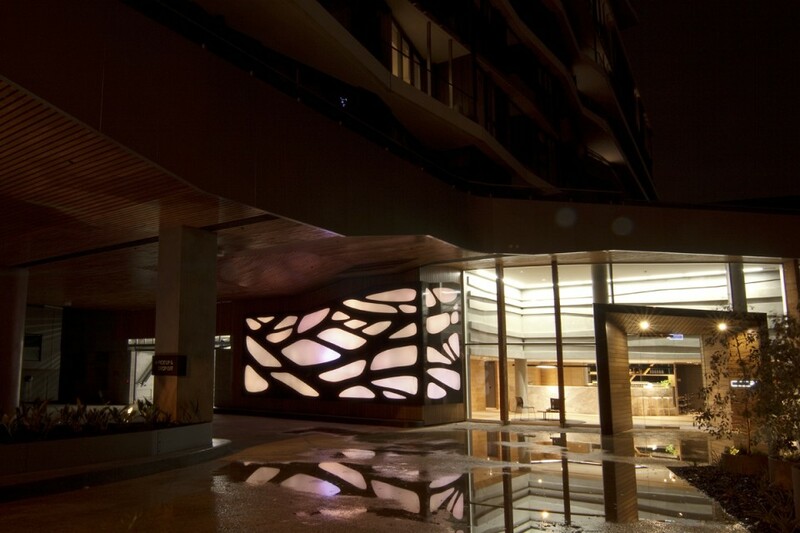 The windows are lit by an array of 600+ LED’s in each wall. These lights change colour from week to week marking the progress of the seasons. 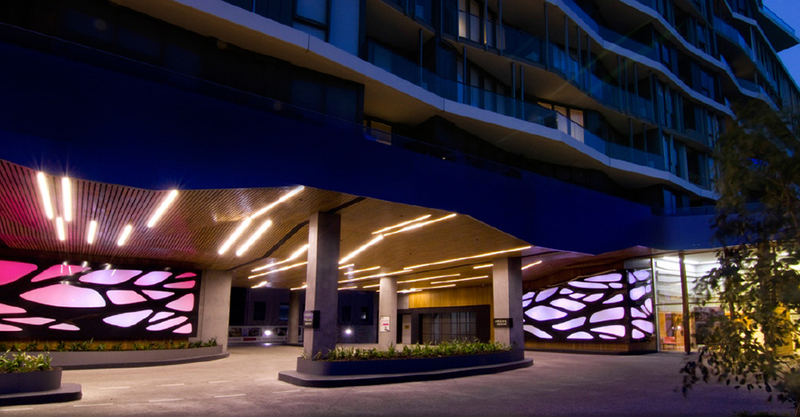 We worked with the project horticulturalist to develop a palate of colours for each week’s ‘light show’ that was drawn from local flowers and foliage likely to be in bloom that week. The lighting display is not static but rather a very slow moving (morphing) light show. It isn’t fast and flashy. Instead it’s restful and profound. 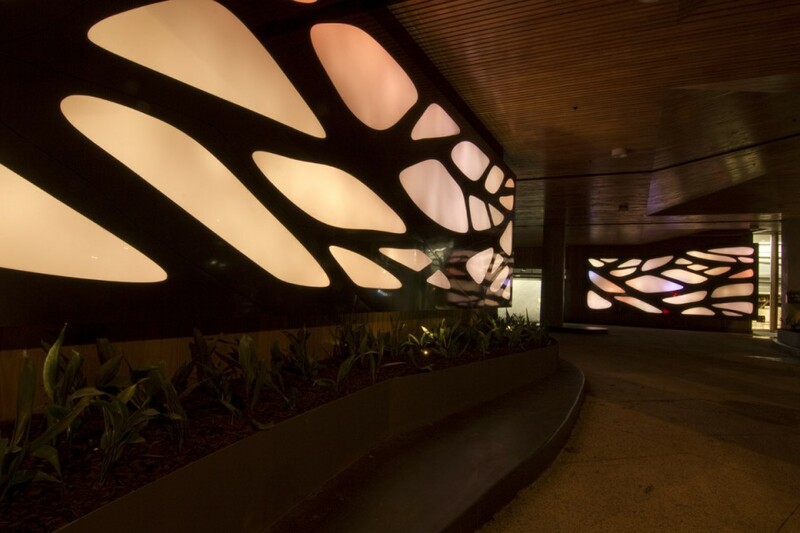 Images showing the walls within the development, courtesy of the Hampton Group. Video documentation, including an interview with Priscilla, and showing stages of construction and install, courtesy of the Hampton Group. 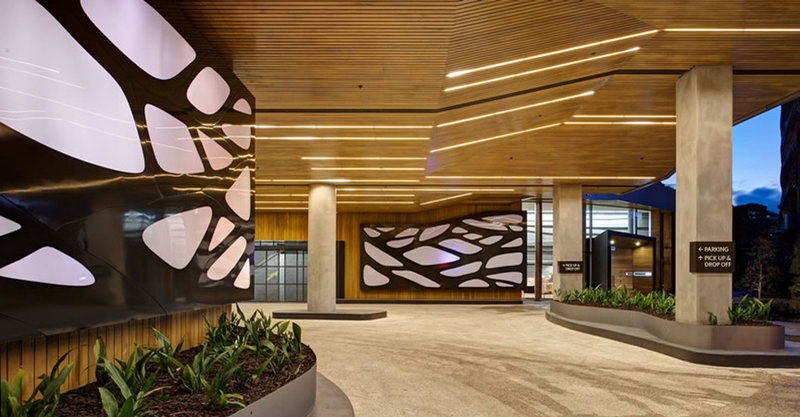 Below is a video showing the slowly moving patterns, as large blobs of colour shifting and mixing across the wall. These colours change from week to week marking the progress of the seasons. This video shows the work as it would appear in mid Autumn (May).